His Excellency Saeed Mohammed Al Tayer, Managing Director and CEO of Dubai Electricity and Water Authority (DEWA), has invited companies involved in concentrated solar power and solar photovoltaic (PV) technology to participate in the third Dubai Solar Show, the region’s largest solar energy exhibition. The show, which is organised by DEWA, will run in conjunction with the 20th Water, Energy, Technology and Environment Exhibition (WETEX 2018) and the World Green Economy Summit 2018. It will be held from October 23 to 25 at the Dubai International Convention and Exhibition Centre and will cover approximately 14,000sq m of space and attract 125 exhibitors. “Organising the third Dubai Solar Show highlights the UAE’s leadership in this field, as well as its increasing reliance on solar energy and transformation to a green economy,” said Al Tayer. “At DEWA, we are keen to embrace sustainability in all aspects of our business – environmental, social and economic – to ensure a sustainable future for generations to come. “This goal supports the UAE Vision 2021 project, which hopes to improve air quality, conserve water and increase renewable energy use in the emirate, plus the Dubai Plan 2021, which will establish Dubai as a smart and sustainable city. The UAE Centennial 2071 project aims to improve the economy, education and government in the UAE. “A number of initiatives have been launched to achieve global leadership in the sustainable development sector. The Green Economy for Sustainable Development initiative, launched by His Highness Sheikh Mohammed bin Rashid Al Maktoum, and the Dubai Clean Energy Strategy 2050 both aim to transform Dubai into an international hub for clean energy. By 2020, the hope is that 25 percent of Dubai’s total power output will come from clean resources and 75 percent by 2050. “Through its participation in the Dubai Solar Show, DEWA will review its efforts in research, development and innovation in the field of solar energy. It will also assess the achievements of the Mohammed bin Rashid Al Maktoum Solar Park, which is the largest single-site solar park using the independent power producer (IPP) model. The Dubai Solar Show is an ideal platform for businesses and institutions to learn about the latest technologies and trends in the growing solar industry. DEWA expects to welcome research and education institutions, manufacturers, suppliers, distributors and engineers to the show. 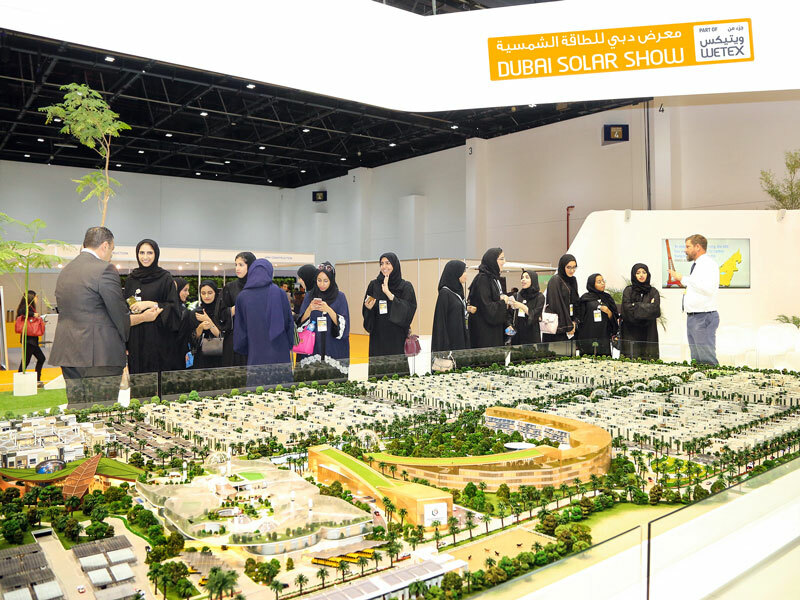 Al Tayer has called on all parties responsible for solar energy projects to participate in the Dubai Solar Show due to the benefits offered to exhibitors and participants. The show enables companies to present their products and brands, communicate with pioneers of solar energy and build relationships with decision makers, entrepreneurs, investors and buyers. Furthermore, exhibitors will gain a greater understanding of the existing and planned solar projects in the region, the latest market trends and legislation set by the authorities. Yousef Al Akraf, Executive Vice President of Business Support and Human Resources and Chairperson of the Sales, Logistics and Sponsorship Committees at WETEX, said: “The Dubai Solar Show offers exclusive benefits to participants, such as free registration for DEWA’s products, letters of recommendation for products participating in the show and exclusive field visits to the Mohammed bin Rashid Al Maktoum Solar Park.